The official Twitter account of Yahoo news (@YahooNews) was compromised weekends. 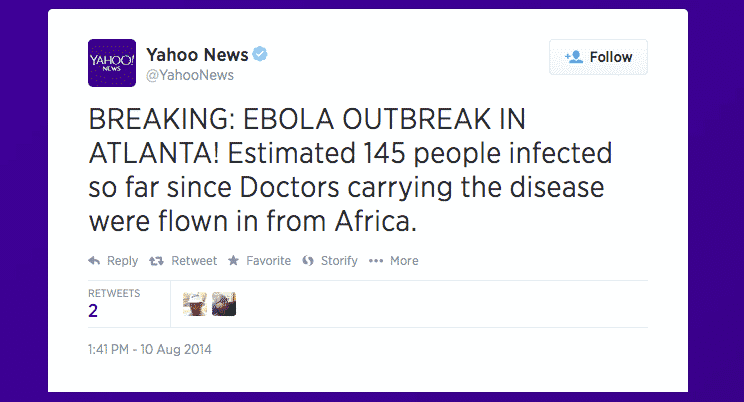 The hacker posted a fake tweet on Ebola outbreak in Atlanta, USA. “BREAKING: EBOLA OUTBREAK IN ATLANTA! Estimated 145 people infected so far since Doctors carrying the disease were flown in from Africa,” Yahoo tweeted Sunday after their Twitter account was compromised. This lead to a scare among Yahoo News followers and the message was retweeted about a thousand time with more than a hundred favorites before it was removed by Yahoo after noticing the hack. Earlier, an unauthorized tweet with misinformation on Ebola was sent from this account; please disregard that tweet. Twitter accounts often get compromised, either by following a phishing link or allowing permissions to any fake app which uses the access token to post or message through the account. But this was a bit scary coming from Yahoo News for its followers.